We are pleased to share our facilities with the broader community with a selection of venues available for hire after school, weekends and during school holidays. 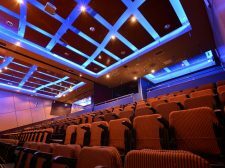 Stuartholme boasts a state-of-the-art, air-conditioned Theatre with full sound, lighting and multimedia facilities. The theatre has an audience capacity of 485, provided through raked seating for 300 and the option of up to 185 chairs on the main floor. Adjoining areas available for hire include the Green Room, change rooms/classrooms and bathrooms. A staff member is available to provide lighting and sound support. Onsite caterers may also be hired to serve refreshments at the adjacent outdoor café and courtyard. During school holidays, accommodation is available for hire for 50-108 in individual cubicles within a variety of dormitories spread over two floors. Accommodation hire includes use of the students’ common rooms, verandahs with spectacular views to the city, the school oval and numerous landscaped areas. Meals may be included in the package, and our catering supplier is happy to provide menus and quotes upon request. Recreation and work areas may also be available for hire. These areas are ideal for camps, retreats and for interstate and international groups participating in metropolitan events requiring accommodation. 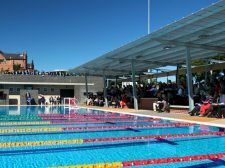 The Aquatic Precinct is a purpose-built facility offering a 25 metre water polo swimming pool with 13 lanes, change rooms, amenities and a tiered seating area. The pool also uses environmentally friendly heating and filtration systems. To enquire about hiring the School facilities, please contact admin@stuartholme.com or telephone (07) 3369 5466. View our facility hire Terms & Conditions. Carolyn, Carolyn Gilby Dance Centre "For the past seven years, I have held my dance centre’s end of year concert in the beautiful Joigny Theatre at Stuartholme School, Toowong. The grounds and views are truly spectacular. The Theatre is perfect for us – a very large, non-slippery stage with plenty of space side stage. Lots of dressing area in adjoining class rooms and a beautiful Green Room to assemble the students. Lighting and sound facilities are suitable for our needs. The theatre comfortably seats our patrons with a roomy foyer. The adjacent courtyard is perfect for selling of snacks and drinks. All facilities are always very clean and tidy. The staff are fantastic. Very communicative and helpful. Particular mention to Karen and Danika."